June 22, 2017 – Canadians appear increasingly underwhelmed by the performances of their provincial premiers. While some are taking steps back from alarmingly low approval levels, others find themselves sliding into previously unknown territory. The rest find their fortunes largely unchanged over the last quarter. 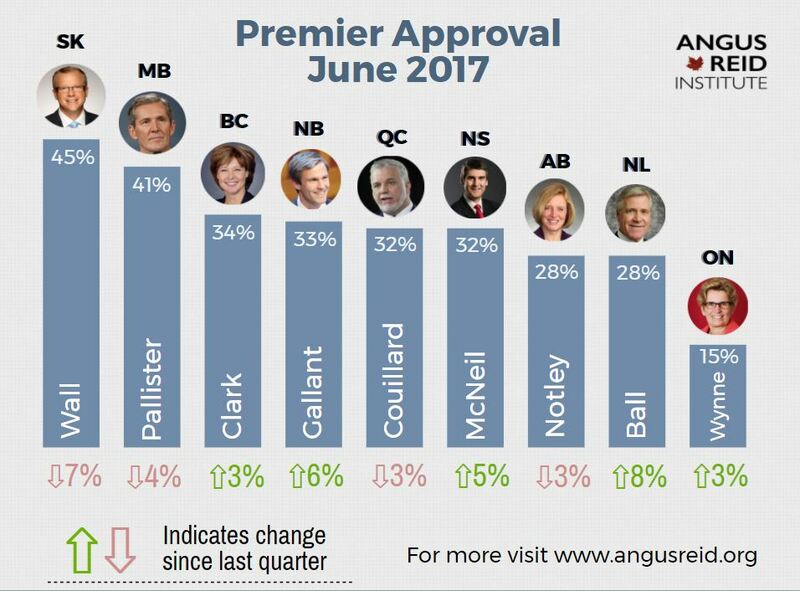 It should be noted that five premiers post higher approval than last quarter in their respective provinces, up from only one in March. Atlantic premiers are among those experiencing the largest increases in approval – Newfoundland and Labrador’s Dwight Ball and New Brunswick’s Brian Gallant are up eight points and six points respectively. In Nova Scotia, Stephen McNeil won a second straight majority government, though a slim one, in the May 30th general election. His rating increase five points. Given that three months ago all three leaders had approval levels in the 20-30 per cent range (Ball still does), this is no doubt welcome news for them. Also in the plus column – Ontario Premier Kathleen Wynne. Canada’s least popular premier, Wynne rebounds slightly this quarter to 15 per cent, ending a precarious slide toward single digit approval. Facing an election about a year from now, Wynne’s government has recently introduced a plan to raise the minimum wage from $11.40 an hour to $14 an hour in 2018 and $15 in 2019. It also launched a basic income pilot project and tabled a budget that rolls back a significant and highly unpopular increase to hydro rates. BC Premier Christy Clark, whose party lost its majority in the May 9 general election now has the approval of one-third (34%) of British Columbians. Heading into an unprecedented legislative session on June 22, it is unclear how much longer she will hold the job should her caucus lose the confidence of the legislature. Saskatchewan’s Brad Wall continues his tenure as most popular premier in the country – but from a weakened position. For the first time since November 2010, the number of people in that province who say he is doing a good job has fallen below the majority level, to 45 per cent this quarter. This represents a decline of seven points, largely attributable to a tightening of the provincial purse announced in the new budget. The Angus Reid Institute has a more detailed analysis of the political landscape in that province here. Next door in Manitoba, Premier Brian Pallister’s approval levels have dropped for the third time in as many quarters, down four points to 41 per cent. That said, he maintains his spot as the second most popular premier in the country. The sojourning premier continues to face questions about the amount of time he spends in Costa Rica and his methods of communication with staff while he is abroad. In more policy related news from the past few months, Pallister took umbrage with Ontario’s minimum wage hike announcement and the preceding rate bump in Alberta in a video posted early this month. His government announced an alternative plan – to tie minimum wage to inflation increases. This, after freezing Manitoba’s wage rate at $11 an hour after last year’s election victory. Declining three points each are Quebec’s Phillipe Couillard and Alberta Premier Rachel Notley. Couillard made waves recently by voicing his desire to reopen the constitutional debate over his province’s place in the Canadian Constitution. His government released a 200-page document restating the “five conditions” put forth by premier Robert Bourassa in 1986, including the recognition of Quebec as a distinct society and a guarantee of Quebec’s representation on the Supreme Court. Quebecers’ response to this appears muted – his approval stands at 32 per cent. In Alberta, pipeline politics are once again front and centre. The election result in British Columbia has put the future of the Kinder Morgan TransMountain pipeline in some doubt. Notley has been vigorously defending the project in the name of Alberta’s economic interests, but it may not be enough in the face of a renewed, refreshed challenge from a newly-united right-of-centre movement. While a unified opposition led by Jason Kenney gains steam, the premier’s approval drops three points this quarter to 28 per cent.